For a long time the Christian Women’s Fellowship in Henry has used its creative skills to help others. Decades ago they made bibs for the Jacksonville Home. After this need ended, Linda Machroli—standing in the center of the photo, drew the group’s attention to the Linus Project in which blankets are made for children in need of comfort, distributed through fire and police departments. 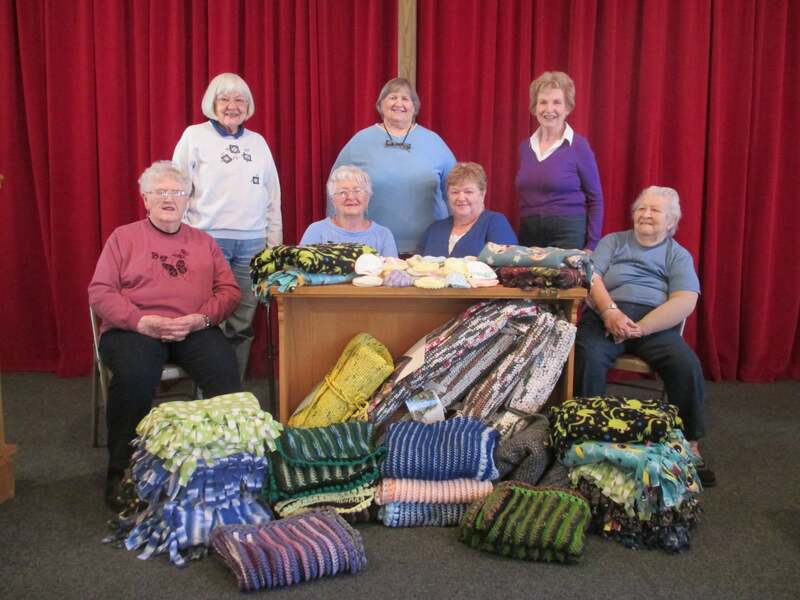 Marian Crook—seated to the left in the photo—who knew how to make fleece blankets, led the group in this project. This year twenty-eight blankets were completed. Under the direction of Carol Chase—seated to the right in the photo, the group added Mats for the Homeless to their project list this year. Carol, who had experience making and crocheting plarn, was the obvious leader for this endeavor. Each mat takes hours of work and thousands of plastic bags. In spite of these obstacles, the group finished six mats this year, which were delivered to the Peoria Rescue Mission. This project has involved many members of the community. JoAnn Jassman from the Washburn Christian Church made half of the mats. One of Carol’s neighbors cuts the bags into plarn, and numerous community members have donated the needed plastic bags. The outreach does not end with the Linus Project and Mats for the Homeless because Pat Icenogle—seated center—makes hats for preemies. See these clever creations heaped in the center of the table. JoAnn Jassman and Muriel McKee contribute to this project. Rev. Pat Jones is the minister of First Christian Church (Disciples of Christ) and Washburn Christian Church. Two other workers are blanket maker Jean Hoover—standing left—and mat maker Jean Wallace—standing right.